It is rare that I go out of my comfort zone and try something new, especially where comics, movies, and fiction in general are concerned. There is a set of things I go for. 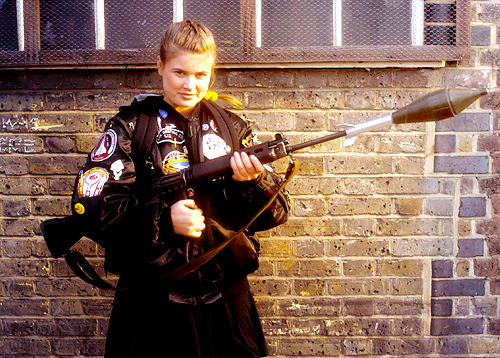 I love Laser guns, I love predictable cliche stories, and generally I like Doctor Who (but I think this goes without saying). When I do go out of that comfort zone I usually come back with a respect but not a . . . Can't wait for the next one. . . "
But this week I tried something new. 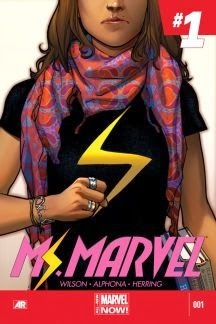 I have been catching articles for the last few months about the new Ms. Marvel that Marvel is bringing out. The articles kept talking about how groundbreaking it will be not just for super hero stories but for comics in general. It was being compared to those early issues of spiderman, you know back when Peter Parker was going through the angst of high school. Its a story we all know. The twist is that the main character is a young muslim girl who is making her way through high school in New Jersey while being an uber fan girl of the actual heroes especially Captain Marvel (Carol Danvers). I had to give it a try. I'm going into this fresh in several ways. 1) I am not up to date on the Marvel Universe. I pretty much stay in the silver age. 2) I am not up to date on previous Carol Danvers versions of Ms. Marvel or Captain Marvel. 3) I am ashamed to say it but I don't keep up with many female characters. Its not for any reason but none of them have piqued my interest to this point. I looked it up on comixology and downloaded it and it is worth the hype. The Art reminds me of so many of the independents that line the aisles at Heroes Con. It doesn't have the perfect lines that I have become used to in the modern marvel age of comics. It doesn't feel so mechanical. Actually it looks and feels very human! I am only familiar with Adrian Alphona's previous work in passing. I have seen his art in Runaways and it was good but beyond that I have not really paid attention. But I am glad I picked this up as now I am a fan! of this line. While the story is just starting and we haven't even seen what the our hero, Kamala Khan, can do yet, we do get a sense of where it is going. This story is going to deal with being a teenager in many of the same ways that Peter Parker dealt with it, but at the same time we are going to find the cultural ramifications that Kamala will deal with both in society and with her family all the while dealing with super powers. 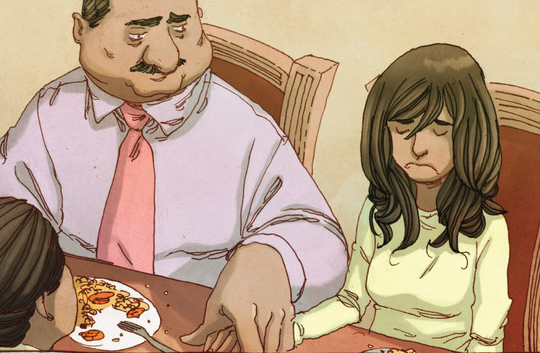 This new Ms. Marvel is a part of Marvels move to strive to push strong female characters. I have to say I am excited to see where this is going. this is a strong book and I will come back. Hopefully it will break me out of my comfort zone and let me explore lots of other good comics that are out there. If you get a chance to pick this book up I recommend you do it. Even if this book is not the kind of thing you would pick up I think it is well worth it! Take the time to check it out. What are some comics that may have been out of your norm but you picked them up anyway . . . and maybe even enjoyed them. I would love to hear some suggestions of what to pick up next. 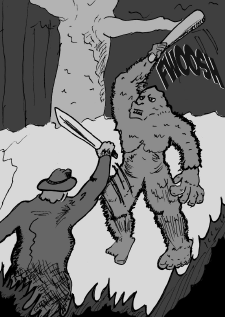 Over the past few months I have been jumping into some kickstarter projects. I jumped in on the Cool and Collected Magazine project and my friend Scott Fogg's Comic project Phileas Reid Knows We're Not Alone. I have enjoyed sponsoring dreams. In the case of Scott and his project is kind of local and it is always nice to help out locals. It helps that his comic also is amazing! Another Kick Starter I am very excited about is another local friend of mine. Ryan Faricelli is putting together a book called "On a Roll: Level Up Your RPG" in which he is imparting tips and tricks on playing and running RPGs. The book will cover both the tabletop and LARP verity of games. Ryan has been playing these sorts of games for over 25 years and I think if this is something you are interested in this will be a great project to back. I think it will be especially good if you are new to the hobby or want to learn a little bit about it. Check out the Kickstarter Page HERE and you can watch the video below! Playing these kinds of games is something I love but unfortunately I don't get the chance to play like I was once able to. I am looking forward to reading Ryan's thoughts on the subject. Are there any Kickstarter projects you are looking or have already backed. I would love to know what some of you are looking at! 2013 wasn't quite the year I had wanted it to be. Instead of the year of doing I had anticipated this time last year, it was a year of learning. I'm ok with this as it made it equally as important to me. figure to complete my collection. While the comic has taken up a large part of my year its not the only thing I have done. I have continued doing toy shows, although I have done quite a few less this year. We did three shows this year to some success. Through this though, I have focused my collecting a bit. I am literally one figure away from finishing my Masters of the Universe figure collection, and I think I might actually have one of those coming. I have found other great things to add to my collection as well, but I have also cut it back to make it more focused. I am cutting out the clutter. A few of the Thor issues I have gotten this year while building the collection! been slowly completing a collection that my dad started years ago. I am down to needing 56 issues to complete the original run of Thor comics! It has been a really exciting adventure to go on. I've learned a lot about an scene I have really been away from for some time! I am really excited about getting even closer to finishing this collection in 2014. In the middle of the year I had a few bad experiences. Now the great things about bad experiences is that you learn how to become stronger through them. One of the big things is that I broke a leg. Now, this seems kind of menial as people break legs all the time. Mine wasn't really that bad, but it helped me learn to let go and realize some things will go on even if I'm not around. I was out of work for 2 weeks and off my leg for 6. I learned to depend on people. We stayed at my in laws or my parrents house for most of that time and they all helped me get through it. I have to admit they were saints because I was a bear during most of the time! It was a dark period. During that time Timegate occurred. Without me. For those of you who don't know Timegate is an annual Doctor Who and Stargate convention that happens over memorial day weekend. I am the co-director of the the Doctor Who Track. It was really tough for me to miss. I got the play by play and of course I took part in the planning. But I was super excited about this year and I had to miss it due to my leg. But I powered through and now I have this year to look forward to. After this I did get to go to heroes again this year. and I traversed it with a broken leg. Its not something I would want to do again, but I am glad my wife encouraged me to go! It was another great year! 2013 was kind of a dead year for the New Monster Project, which is a pop culture, geekery, video group that I am involved with. We brought on a new member and have been planning a fairly major relaunch that involves my comic, videos, and even some podcasts. I'm pretty excited about where we will be going over the next year. 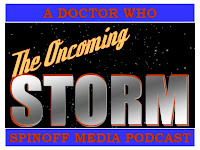 In 2013 I continued working on "The Oncoming Storm" podcast, which is a Doctor Who Spinoff media podcast. Because of this I have read lots of books, comics, and ebooks, and listened to lots of audios. Actually I would say I have read more this year that I have in any other year. I'm proud of that, I'm really happy that I have been able to be a part of that podcast! 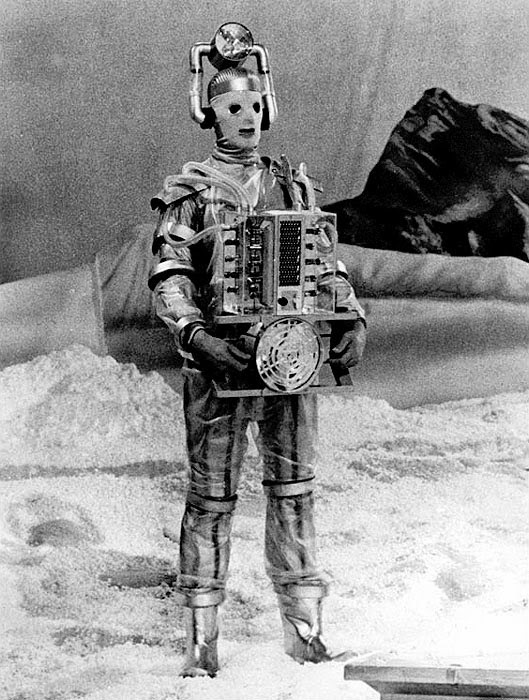 Speaking of Doctor Who I would be remiss if I did not mention the fact that this was the 50th anniversary of Doctor Who, and while I am not directly involved with Doctor Who, anyone who reads this blog will know it is a huge part of my life. So the 50th anniversary was a big deal. It was a great time to reflect on the show that I love and get a lot of new insight on it. and through the process I may have even become a little more tolerant of new fans, which an't be a bad thing, can it? Looking back on all of these thing I see that it probably has been a busier year than I really thought it was. All in all its been another Whirlwind of a year. How was your 2013.